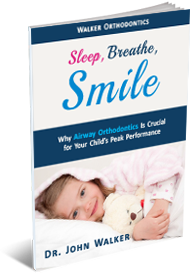 What The HECK Is Airway Orthodontics & How Can It Help My Child? Airway Orthodontics not only seeks to straighten crooked teeth but also seeks WHY your child has crooked teeth to treat any underlying causes of obstructed breathing, so your child can enjoy a lifetime of optimum breathing and perform to their full potential. A good night’s sleep, no longer struggling to breath while sleeping. Breathe better, feel better, perform better in all aspects of life. If You Could Improve Your Child’s Life Beyond Straight Teeth, Wouldn’t You? What Makes Walker Orthodontics Different? Our orthodontist in Lunenburg, MA, and Harvard, MA, Dr. Walker, is the Director of Airway Courses at Boston University and has incorporated his expertise in Airway Orthodontics into his treatment approach. Airway Orthodontics is a medical subfield that studies the established link between optimal breathing and long-term health benefits. Certain oral habits and breathing obstructions can force your or your child’s body to compensate for lower oxygen levels. Our orthodontists at Walker Orthodontics have helped over 35,000 patients in the Central Massachusetts area and beyond since 1978. We strive to help transform thousands of smiles for patients like you! You can rest easy knowing that our Walker Orthodontics team is able to help you reach your smile goals. We know the field of orthodontics is ever-changing and requires regular continuing education to stay on top of cutting-edge treatments. No two smiles are alike. That’s why we offer our patients at Walker Orthodontics a FREE Smile Assessment that includes a comprehensive look at the health of your teeth and an evaluation your smile goals. We’ll conduct x-rays of your teeth, check out your bite, and make some recommendations, but not without answering all of your questions first. Together, we’ll decide on the course of action best suited to your unique needs. We want you to feel completely comfortable from the moment you walk into our orthodontic office. We do this – not only by offering exceptional orthodontic treatment through extensive experience – but also by offering you our Satisfaction Guarantee and our Faster Tooth Alignment Guarantee over the course of your treatment. Furthermore, if your teeth begin to become unaligned – even if you didn’t wear your retainer – come back and see us so we can realign your smile! Walker Orthodontics is committed to offering quality orthodontic care to every person in Central Massachusetts who needs it. That’s why we extend our orthodontic care to the Spanish-speaking community. We want to make treatment a seamless and comfortable process for you and your family. If you live in the greater Central Massachusetts area and are looking for a Spanish-speaking orthodontist in Lunenburg, MA, or Harvard, MA, who can accommodate your family, contact us today! We want to make treatment easy and affordable for you or your loved one once you walk through the doors of either our Harvard or Lunenburg orthodontic offices. We offer in-house financing, plus 0% care credit plans to make it easier for you to afford braces you or your family members need. We also offer discounts to first responders and veterans, for payments paid in full upon treatment completion, and to families.